Organizations design success promotes relations: relations of people within the firm, relations of strategic chioces within environmental features. The modern firm serves to coordinate the actions of people and motivate groups of people to carry out activities. An individual’s self-interest presents on-going motivation challenges that compete against what an organization wants. Quick example: someone with a fixed salary who works extra hard provides the firm with their gain from increased output generated. The gains accrue to the firm, not the worker, whose salary does not change. Personal view competes with organization view and in that case, what happens? 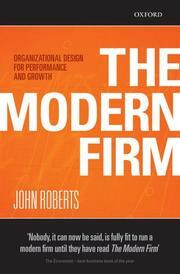 In, The Modern Firm: Organizational Design for Performance and Growth, by John Roberts, the design goal is to shape the organization to align interests of its members to increase efficiency of choices for the total organization value. Brief: The most fundamental responsibility of a general manager is to craft strategy and design an organization where the strategy can succeed within the economic, political, legal, regulatory, social, and the technological environment the firm operates. A direct challenge to the design is finding alignment within the environment. The right strategy or design is an ongoing process of adjustment as the environment changes, as the strategy develops, and as the organization evolves. Attraction: I read this hardcover in 2003. At the time I was about 4 years into the practice and study of strategy and organization design/development/behavior. Before this book, most of what I studied was driven by management theorists, their case studies, and experiences they shared observing and influencing firms, people, motivation, and behavior. Unfortunately, I found too many hard-boiled business and technology people gave little time or patience for those overly academic, management theories around people and motivation. The way firms organize themselves and exercise authority provides more insight and upside than just a change in processes and routines. This is a far more analytic, business case for strategy and the critical design elements for effective organizations. Author John Roberts, an economics professor at Stanford Business School, presents a book that ties economics and environmental factors to strategy and organization. Those used to looking at behavior-based change may get turned off by the serious economics rationale for strategy, I found an absolute need to allow me to tie people to firm success, strategy to motivation, design to operations. This was the first in shifting my perspective to make a business case for change and a financial case for motivation. Also, some see my current reading list for a set of books and influences.